Columbia Precast Products can find a solution for a wide variety of applications that will save time and money, and give you superior results. 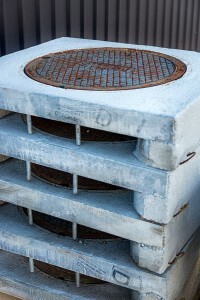 This carries over to custom precast projects as well. Our experience in custom casting ranges from boat ramps to railroad crossings, and many other options in between. Our panel vaults are perfect for protecting public utilities, such as protecting underground cables and safeguarding communications equipment. Being customizable, these can save you time and money, especially in value-added engineering. We can incorporate many different features to accommodate your project’s needs. Columbia Precast Products has more than a century of combined experience in the precast industry and designing marine precast products. 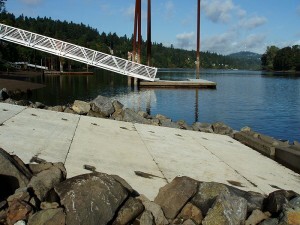 We manufacture precast concrete boat ramps that meet state specifications, and all of the ramps we cast utilize high strength structural concrete. Increased savings for installation. A precast unit can be installed in one day, maybe two; on the other hand, a ‘pour in place’ structure can take as long as a month (from start to finish). Creativity/variation in shapes and sizes. Instead of fitting a square into a round hole, you can customize your piece to fit in any size you need. Job sites have different conditions, and our custom structures can account for these. Better control over the raw materials and batching. 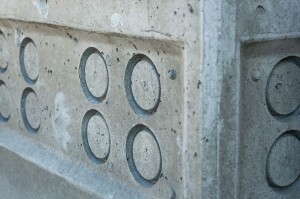 This allows a precast plant to develop a better overall product. Columbia Precast Products has the experience and manufacturing capabilities to custom-cast any precast concrete product. For immediate help with your custom cast product needs or any questions you may have, please contact us today.